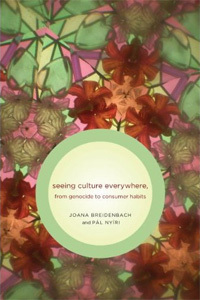 This is a pre-publication of the introduction, titled “A note on this book”, to Joana Breidenbach and Pál Nyíri’s forthcoming volume, Seeing Culture Everywhere: From Genocide to Consumer Habits (Seattle and London, University of Washington Press, 2009). Mrs. Moore reflects on Magistrate Heaslop’s opinion of Dr. Aziz in E. M. Forster’s A Passage to India. In 2001, we published an article in the German management journal Organisationsentwicklung, criticising the “intercultural communication” profession for perpetuating reductive views of cultural difference that, we argued, were often based on false premises and did not help reduce cultural misunderstandings and mistrust. Yehuda Elkana, rector of Central European University where Pál worked at the time, read the article and said: “Fine. You convinced me that their approach is counterproductive. But then what do you propose? Government officials, too, are told these days that culture matters – but they have no clue in what way, and they have no place to find out.” Stephan Breidenbach, Joana’s husband, long involved with German government policy making, made the same point. “How are they supposed to know better if nobody offers them an alternative’” he asked. In his book Foreign News, anthropologist Ulf Hannerz lamented the inability of anthropologists – the professional students of human cultures – to respond adequately to “one-big-thing” books such as Huntington’s Clash of Civilizations by presenting alternative visions that were clear and accessible. “Leaving an intellectual vacuum behind is not much of a public service,” he wrote (Hannerz, 2004:232). In fact, Hannerz may have been charitable: alas, anthropologists rarely make as much as a dent in the armour of grand simplifiers like Huntington, much less leave behind a vacuum. A growing number recognize this as an urgent problem. In a recent debate on the subject, Catherine Besteman and Hugh Gusterson wrote that “we need vigorous translation work” from the language of anthropology into a publicly accessible one “to explain that Islam is malleable and diverse, that Egyptian peasants are part of a globalized economy, and that ethnicity is always in historical flux” (Besteman and Gusterson, 2008). We felt that the bandying about of the word “culture” by well-meaning but clueless officials and corporate executives was an opportunity to do just that. After decades during which decision makers listened to political scientists and psychologists, wasn’t this a chance for anthropologists to talk about the subject they knew best? As a first step, we began working on a course, entitled “How Does Culture Matter’”, intended to help government and corporate managers without a background in anthropology to make critical judgements in debates involving cultural claims. The course became a core unit of the applied anthropology curriculum at Macquarie University in Sydney and spun off a popular blog, Culture Matters. Discussions with colleagues in both Sydney and Berlin – notably Katherine Biber, Stephan Breidenbach, Alex Edmonds, Nicole Graham, Stephanie Lawson, Chris Lyttleton, Chris Houston, Bob Norton and Paul Cohen – students such as Stephen Cox, María José Cruz-Guerrero de la Concha, Katrien Gedopt, Lindy McDougall, Atsushi Murata, Siham Ouazzif, Carlos Palacios Obregon, and Anupom Roy, seminar guests such as Bibiana Chan, Marc Rerceretnam and Noelene Rudolph, and blog readers helped raise new questions, and we are grateful for them. We also presented our ideas to Macquarie’s Department of Law, giving us some valuable exposure to the reactions of non-anthropologists. Farther afield, we are grateful to Alan Smart for his insights on the “cultural turn” in the competition between cities. We began this book on a plane from Barnaul, Southern Siberia, to Moscow on an autumn day of 2004. We continued writing it in various settings: in Joana’s houses in Berlin and on the Côte d’Azur, at Macquarie University and at Kawa and Dov, two cafés in Sydney; at the Satri House in Luang Prabang, Laos, and in Pál’s Budapest flat. The Anthropology Department at Macquarie University provided a stimulating and collegial home to Pál throughout this project, and our editor Lorri Hagman has helped and encouraged us, as she has done on previous occasions. Two anonymous readers for the University of Washington Press offered a great deal of helpful comments. Our thanks to them. Muhamad Sadr-Azam’s cell phone beeped: he had a new text message. Muhamad glanced at it as he pulled the Toyota over to the parking lot of his daughter’s school. “Order your lamb for a joyful Eid now!” it read. “If they have to pester everyone with this niche marketing, they should at least know their customers,” Muhamad muttered. “Persians don’t have a big Aid celebration the way Arabs do”. As his daughter got out of the car, he saw her greet a friend wearing a school uniform headscarf. At school Melissa was classified as a Muslim: this was needed so she would get no pork at the canteen. It also meant that when her class took part in sport events or went on school trips, teachers always approached her to ask whether she was going to participate. This annoyed Muhamad: why wouldn’t she go like all the others? But what really worried him was that since the summer holidays Melissa had taken to hanging out with a bunch of headscarf-wearing Pakistani girls. His wife had once caught her trying one on in front of the mirror. And teachers at the school seemed to take this for natural. Muslim girls wore headscarves, after all. Commons leader Jack Straw had been right to ask women visiting his office to remove the veil from their faces. It did, as he had said, make communication difficult. But on this morning’s radio news, there had been a big debate on his comments, with the head of the Racial Equality Commission warning of possible riots over his remarks. Next on the news had been a report about Liverpool’s preparation for being the European Capital of Culture in 2008. Kiran Desai had received the Man Booker Prize for a novel about immigrants living between cultures, and twenty-five people had died in Iraq during one day’s clashes between Sunnis and Shiites. “The news used to be very different 26 years ago”, Muhamad had said to his wife as she pushed a bowl of Weetabix over the breakfast table towards him. In 1980, when he had arrived in London from Tehran after the Shah was deposed by Islamic revolutionaries, the world was also undergoing violent upheavals. But the way people talked about them was different. They said the Brixton riots were the result of social exclusion and economic deprivation. The formation of Solidarity in Poland was struggle against Communist oppression, and the violent clashes during the British miners strike were a class issue. Now wherever one turned, people talked about culture as being at the root of things. As Muhamad passed Brick Lane, his thoughts came back to Muslims in Britain. Some of them, perhaps from this neighbourhood, were now planting bombs in the Tube – but others didn’t think twice of putting Ganeshas in their restaurant windows to attract the tourists who came for “Indian food”. Stepping out of the car outside his Hampstead dental practice, Muhamad was greeted by the owner of the fish-and-chips shop next door. Mr. Xiang was pouring a bucket of fishy water into the gutter. Why do the Chinese have to do this, can’t they behave like us, he thought, turning his head to avoid the pungent smell. A look at the full waiting room slightly improved his mood. He had been getting paranoid lately, with all the suspicious looks people gave him nowadays, especially on public transport and when boarding a plane. When some of his old patients hadn’t shown up for their regular checkups, it had been easy to imagine that they were afraid of handing themselves over to a Muslim dentist. In his small back office he quickly checked the website of the local council. It was Black History Month: Hampstead was “celebrating the achievements and history of Black African and Caribbean communities who live and work in the Borough”. He went through the program and ordered two tickets for a poetry reading the coming Friday. Then he buzzed in the first patient. It is market day in the Bolivian town of Tarabuco. Pilar Fernandez sits in front of her stall watching a group of tourists walk down the aisle. They could be Italians, by the way of their looks. Or Spaniards? No, their quilt-like coats clearly identify them as Italian. They have come here to the Altiplano to see “the famous handcrafts market, one of the most authentic on the continent. The inhabitants still wear traditional dress and their life style has not changed since the arrival of the conquistadores”. Pilar has read this on a travel website in the local internet café. When the tourists pass her stall, she draws their attention to a beautiful manta, a cape-like blanket. “These are a very important part of our traditional culture”, she explains to them. “If you go to the textile museum in Sucre, you can see them displayed there too.” Although this is a sales pitch Pilar often uses, it still fills her with immense pride to think about textiles like her own artfully displayed in the museum. It was good that Doña Cristina Bubba Zamora had fought for the museum and that she relentlessly tried to recover ancient Bolivian textiles which had been stolen by Spanish colonists and American art dealers. Doña Cristina was also the one to get her and a group of other women weavers small credits for looms and workshops to revive their textile culture. Thinking of this, Pilar reminds herself of the appointment later this afternoon with the Fulbright researcher who had come to town to complete a cultural impact analysis of the microfinance project. As Pilar makes her way down the main street towards the primary school, the intense light of the midday sun reflected by the whitewashed walls made her squint. In a week’s time her husband, Juan, would come back from Europe. As a member of Evo Morales’ MAS party and leader of the local union of coca cultivators, he received an invitation to the Enlazando Alternativas II, the second Alternative Development Summit in Vienna. The trip had been paid for by a German NGO, and Juan was to speak on the legalization of coca for medicinal and cosmetic purposes. Coca is their livelihood, and Juan sent her a newspaper clipping of himself and other Andean activists in front of a castle holding a banner announcing “Coca is Part of Our Culture”. Waiting at the school gate, Pilar gets out the local paper, Diario El Potosí. On the front page is a report about five silver objects that have been stolen from the famous pre-Incan site of Tiwanaku. A spokesperson from the Directorate-General of Cultural Heritage offers a reward for information leading to the recuperation of the objects. In another article, a representative of UNESCO – whose World Cultural Heritage list includes Tiwanaku – asked whether the country has taken enough security precautions to safeguard its heritage. In the Cultura section Pilar reads about a Turkish writer, Orhan Pamuk, who has won the Nobel Prize. The Prize committee praised him especially for “discovering new symbols for the clash and interlacing of cultures”. Then the bell rings and hundreds of school children in uniforms burst out of their classrooms. Jason Carter was on his way out of the office. Tomorrow he would confront Mr. Li directly about the results. He was fed up with waiting, being put off day after day, week after week. This was simply costing too much money. The shampoos should already be in the third test phase by now, and he was still waiting for the results of the first round. Nobody in Cincinnati would give a damn about the reasons for the delay: the CEO couldn’t care less if in Chinese culture people didn’t talk straight. All the CEO wanted was a share of the booming Chinese cosmetics market. The people at the TouchFeelCulture Lab – the company’s recently created ethnographic research department – had done a good job. Chinese hair culture, they found, was very different from its American counterpart. Not only did Chinese women wash their hair in summer much more often than in winter; depending on the season they used different products too. And many used a water bowl instead of running water, which often was interrupted or not available. So when Jason had arrived in Shanghai six month ago, his first task had been to come up with a formula for easy-to-rinse shampoos. He had handed various options over to Mr. Li, the head of the local company laboratory. And has been waiting for the results ever since. Leaving the building through the sliding brass doors and disappearing into the grey smog that covered the high-rises across the street, Jason felt drained. Where had he gone wrong? Why couldn’t he communicate as efficiently as at home? The company had paid for a pre-departure training to prepare him for this job. During those three days he had thought he learned a lot about Chinese culture. How Chinese were collectivistic, and how he, an American, was individualistic. An important part of Chinese culture, the trainer had stressed, was acceptance of authority. Accordingly, Jason had tried to establish strong leadership over his department, even though this went against the egalitarian company culture. Yet what were the results? Maybe none of his formulas had worked and Li didn’t want to make him, the boss, lose face by saying so? Or maybe Li was having problems getting them made and was afraid of losing face himself? This face business seemed to be an important part of the culture. Went all the way back to Confucius, or something like that. He would look it up in this book that had been lying on his bedside table for the last months, Doing Business with the Chinese. Problem was, he always fell asleep after the first page. For many in the West, today’s world is a world shaped by clashing cultures. The work of Samuel Huntington, who predicted a “clash of civilizations” back in the early nineties, enjoys unprecedented influence: for an academic book to have a sales rank around 2,000 on Amazon.com is indeed exceptional. News headlines use Huntington’s terminology to make sense of American-Chinese relations, “honour killings” of Muslim women in Germany, and problems with the Daimler-Chrysler merger. A group convened by the secretary-general of the United Nations in 2006 to propose ways to bridge the gap between Western and Muslim societies called itself the Alliance of Civilizations and in its report explicitly stated its aim to rebut the “clash of civilizations” theory. Wanting to emphasize the uniqueness of his nation, Estonian President Toomas Hendrik Ilves has called Estonia “a Huntingtonian subcivilization different from both its southern and eastern neighbors” (Bissell, 2007). There is even a computer game called “The Clash of Civilizations” (Pobłocki, 2002:163). As Ilves’s comment shows, however, the fear of clashing cultures is only one facet of the culturalist phase the world has gradually entered in the 2000s. Better put, today’s world is a world shaped by a consciousness of culture that penetrates everyday life as well as matters of state in an unprecedented way. Culture – or, rather, cultural difference – is now held to be the main explanation for the way the human world functions. Its allure is in the promise to explain a broader scope of phenomena than previous grand narratives. If the ideological alternatives posed by capitalism and communism worked to explain international dynamics, they said little about what was happening inside a society. For much of the second half of the 20th century, people would invoke ideas of social class, colonial history and scientific and technological development to make sense of their current situation and to imagine their future. These ideas would be different in different places – Sheffield, Novosibirsk or Dakar. By contrast, the logic of culture consciousness is deceptively universal, and thanks to today’s media, the spread of standard models of economic and social policy and so on – a bundle of phenomena often called globalisation – it is affecting people worldwide. Muhamad Sadr-Azam, Pilar Fernandez and Jason Carter are on the receiving end of ideas and stories produced by institutions such as governments, advertising companies, schools, and of course the media. The spectre of culture is haunting public institutions and the private sector around the world. University degrees in “intercultural communication” and “intercultural management” get record enrolments. Doctors and policemen are sent to trainings in “cultural competence.” Ministers of religion, eager to expand their markets to migrant and non-Western populations, take degrees in anthropology. Policy reports analyse the “cultural factors” and “cultural impact” of armed conflicts (in which the forms of warfare are also said to be cultural), international negotiations and development projects. In an apparent shift of emphasis from searching for the causes of human behaviour in the individual psyche to group cultural traits, banks, advertising agencies, defense lawyers, municipal administrations, and international organizations hire “culture experts”. Makers of cultural policy, funders of art and city planners want to be told about the impact of their decisions on cultural traditions and diversity. Minority groups worldwide, from the Ainu to the Yanomami, enlist the help of NGOs and the global media in their fight for cultural survival, debates on the cultural destiny of Russia fill bookshelves and airwaves, and the Chinese government promotes the construction of “advanced culture” as a matter of national policy. It would be easy to tie the rise of culture as the paramount explanation to the end of the Cold War when the ideological opposition between the two “worldviews,” and the political one between the two superpowers, came to an end, creating a vacuum of explanatory paradigms for global change. Yet in fact, the ascent of culturalism is the outcome of a number of social, political and intellectual trends that have shaped the world since the 1960s, and by the turn of the millennium acquired a force that suddenly swept “culture” into every living room. Only some of these changes have been related to tangible events – such as the collapse of the Soviet Union or the transformation of capitalist corporations – while others are rooted in the internal dynamics of the institutions and cultural elites that shape public opinion. From Cold War to ethnic conflict. Changes in global politics brought about by the end of the Cold War certainly formed the backdrop to much of the story this book tells. The Soviet bloc and the Capitalist West both operated under versions of a rationalist, universalist development ideology, where economic growth necessarily led to a particular kind of more advanced society – liberal democracy or Communism – regardless of ethnicity or cultural context. The reach of these ideologies becomes obvious in places like today’s Afghanistan, where the only voices rejecting ethno-tribal or religious politics – which have formed the basis of government since the American intervention – in favour of a liberal modernization tend to be of elites who studied in the Soviet Union in the 1980s. The collapse of the Soviet Union brought to the surface ethnic conflicts, many of which had been created by the state – for example, by the deportation of a range of peoples, including the Chechens, from the Caucasus to Central Asia – but had previously been contained by it. In absence of political explanations – all of the new states seemed, after all, marching toward market democracy – these conflicts were explained in terms of long-standing cultural and religious differences that had persisted despite having been swept under the carpet by the totalitarian regime. The same explanation was then applied to the bloody dismemberment of Yugoslavia and, indeed, to the rest of the world. Indeed, cross-cultural handbooks on ethnic conflict for diplomats promised to “sort out ethnic identities and calculating their strength” (Fisher, 1998). While, as we will argue, this explanation has often been false – sometimes tragically so – the withdrawal of the great powers from their respective backyards did make room for the emergence of sundry political forces, some of which have pinned local or indigenous cultural purity on their banners. In other words, the end of the bipolar world boosted the currency of both ethnic identities and ethnic explanations. The reach of nationalistic movements was greatly enhanced by the political, economic and technological changes that revolutionized communications and facilitated human mobility in the decade following the changes of 1989-1991. Freedom of travel, previously restricted as a measure of both political control and currency protection (South Korean citizens were not fully free to travel abroad until the 1990s, many years after the democratic transition!) was suddenly a reality. In the early 1990s in particular, with the memory of the Iron Curtain still fresh, both Western and Eastern European countries opened their borders. Although they began closing them again a few years later, this window initiated new flows of migrants and refugees, including those fleeing far-away conflicts, that turned out to be impossible to stop despite later attempts to do so. According to the United Nations, 190 million people lived outside their countries of birth in 2005 – compared to 76 million in 1960. Especially in societies that were used to homogeneity – or have forgotten their multiethnic histories, as did the successor states of the Austro-Hungarian and Ottoman Empires – the appearance of more foreign-born individuals unable or unwilling to conform to traditional expectations of assimilation led to renewed discussions about the nature of national cultures. Even in societies that have always portrayed themselves as constituted by immigrants – such as the United States and Australia – more migration from non-European countries have triggered similar debates. This new movement of people was helped by dropping costs of travel – an air ticket from Lagos to London costs one-tenth of what it did in 1960 – and spurred by images of riches transmitted through satellite television to newly liberalized media markets. Indian villagers in 1985, if they were lucky enough to have access to a television set, saw educational dramas produced by the national broadcaster, Doordarshan. Ten years later, soap operas, celebrity shows and advertising on 11 new satellite channels projected the glamour of global lifestyles to villages that were yet to build a latrine (Johnson, 2000:158). Television, videos and the new medium, the Internet, far from imposing on the world the uniformity of an Americanization as feared by early critics, also facilitated the creation and maintenance of what Benedict Anderson (1983) calls “imagined communities” within and across borders. According to Anderson, the commodification of printed text in Europe in the 17th century and afterwards made possible the wide circulation of narratives of the nation, thus creating the sense of a common belonging with people beyond one’s immediate reach. The spread of “visual capitalism” in the 1990s has created a new, powerful tool to strengthen that sense. In China, the state’s continuing hold on the media in the 1990s, when television ownership became nearly universal, created a national canon of cultural imagery – from the Great Wall to imperial-era costume dramas – that has informed a new generation’s sense of being Chinese. The same technologies have made it possible for migrants to maintain, enhance, or even create nationalist movements despite prolonged absence from their countries of origin and geographic dispersal. Soap operas and dance videos shot in Laos and China have helped Hmong-Americans resettled in rural California in the 1970s codify a cultural identity that links them to the land they left but also to their close ethnic relatives, the Miao of Southern China. For the Miao, the international ties witnessed by the same videos have reinforced a sense of cultural pride and strengthened their hand in negotiations with the Chinese government (Schein, 2005). The worldwide embrace of the free market has played an important role in stimulating both migration and the globalization of media. It has also had far-reaching consequences for companies and work environments. Corporations now want to sell the same product to people around the world, but often, both products and marketing strategies need to be localized as consumers have different needs and respond to different messages. The need to “know your consumer” has generated jobs in “global consumer research” and forced advertising agencies to develop locally sensitive campaigns. In Sri Lanka, for example, they found that advertisements for beer and soft drinks developed in the United States and featuring close physical encounters between men and women are not well received, and embarrassment at the purchase of condoms and sanitary pads can be overcome by reframing them as medicines (Kemper, 2001). One the other hand, the rationality of the free market brought people of diverse origins together on factory floors, in corporate boardrooms and housing estates. This diversification is driven by both corporations and localities competing for investment in a theoretically global market. The most basic form of that competition is lowering production costs. This “race to the bottom” between localities has favoured the employment of migrant populations – either internal, as rural women working in China’s clothing factories, or foreign, as Filipina maids in the Gulf or Romanian strawberry pickers in Spain – deprived of the economic and social rights enjoyed by locals. For their part, corporations are compelled to join the “race to the bottom” by moving production to China and outsourcing technical services to India or Eastern Europe. Moving production and services abroad has necessitated the hiring of local managerial, human resources and public relations personnel, resulting in a fundamental change of their ethnic makeup and operating environment. The best corporations set the pace in diversity. … Employers don’t want hollow harmony. They want a cosmopolitan corporation. Hybrid teams are the new corporate ideal. … An unprecedented number of foreign-born CEOs run major companies in the United States, Britain, and several other countries, according to a study by Denis Lyons, an executive recruiter in New York City. … At the best companies, building diverse teams has become a routine part of business and a central piece of strategy. McKinsey & Co., the global consultancy, illustrates this trend. In the 1970s, most of its consultants were American, and its foreign contingent came from about 20 countries. … By 1999, McKinsey’s chief partner was a foreign national (he hails from India); only 40% of its 4,800 consultants were American; and its foreign-born consultants came from more than 40 countries. An important competitive edge in the knowledge-based economy is the possession of creative ideas, and the speed at which these ideas can be transformed into products or services. World economic development is changing from a quest for resources to a quest for human talents. Fostering the “creative industries” – from fine art to fashion – as a vehicle of economic growth is a strategy that is now spreading from Singapore and Hong Kong to Shanghai and Peking. But the origin of this approach is in the United States, where since the early 2000s, an increasing number of city planners have followed the advice of urban guru Richard Florida that “cultural diversity” – including a mix of ethnicities and a gay scene – is necessary for creating that environment. Emphasizing diversity is now de rigueur for every city hoping to compete in the global market, from Austin, Texas, to Singapore, where the inflight menu cards of the national airline feature work by expatriate artists. Consequently, states are selectively liberalizing their immigration regimes to allow in a flow of highly skilled foreigners, even as they restrict the entry of other migrants and refugees. The race for “creative cities” is one sign that economic planners of the 2000s treat culture as a form of capital – just as French sociologist Pierre Bourdieu suggested in 1986. He defined it as the set of knowledge, attitudes and skills that give a person higher status in society. As desires and opportunities of social advancement, employment, capital accumulation and consumption diversify and expand beyond national borders, and as the goal of education shifts from abstract knowledge to universally marketable packages of habitus and skills, cultural capital – now understood not as a largely inherited set of class-related savoir vivre, as in Bourdieu, but as a toolkit for global living – gains in importance. The explicit or implicit assumption behind both the Australian backpacker ethos of “discovering different cultures” and the Chinese government’s exhortations to improve peasants’ “cultural quality” (Friedman, 2004) is that doing so increases the individual’s value in the “market of talent”. Increasingly, the goal of education – especially higher education – is seen as acquiring globally marketable skills rather than universally applicable knowledge. Part of this is a basic familiarity with “other cultures” – whose spokespeople do their best to emphasise their distinctiveness as a way to draw tourists, whether to a remote country or to an urban neighbourhood. Becoming cosmopolitan globetrotters is no longer the Kantian promise of aesthetic pleasure in appreciating the foreign; parents and children now see “cross-cultural experiences” as linked to a good future life as manager or consultant. So universities compete in providing programmes with names like Semester at Sea or Global Leadership Programme. According to the Institute of International Education, almost 200 thousand Americans were studying abroad in 2003/04, up from 76 thousand ten years earlier. In particular, the number of those studying in China grew by 90% over the previous year (“U.S. Study Abroad Increases by 9.6%, Continues Record Growth”). Yet the number of American students abroad is far below that of their Chinese peers. In the same academic year, fifty thousand new students from China went to Australia alone (Hugo, 2005). If, twenty years earlier, Chinese students in the West had tended to be doing PhDs in science and engineering, now many of them were going abroad while in high school – and the quality of the school is often less important than the “intercultural experience”. Proficiency in English is, of course, very important, but so is the ability to navigate among “whities”. The rush for Chinese nannies for the children of New York executives, too, is about mastering interaction with the future’s superpower – not just linguistically but also “culturally”. Riding on the wave of this mutual obsession, international schools such as Yew Chung – which has campuses in four mainland Chinese cities as well as in Hong Kong and the Silicon Valley – advertises itself with the slogan “Educating the Global Child” and promises to deliver an “education that leads our students to an inner transformation whereby they are both Eastern and Western”. The rise of “symbol analysts” and the cultural turn. The ascent of the economy of culture is part of a broader process: the rise of the group that Robert Reich (1992) called “symbol analysts,” people engaged in the manipulation – creation, explanation and distribution – of data, words and visual representations. These people, the ones “creative cities” compete for – consultants, lawyers, artists, software engineers, investment bankers, advertising executives, political analysts – produce goods and services that account for an increasing share of global consumption and wealth. They also wield tremendous influence in the interpretation of the world and in political and economic decision making as institutions of power devolve an increasing amount of responsibility for their decisions to “experts”. Such situations range from court rulings involving expertise on cultural norms of a defendant’s ethnic group to congressional hearings on foreign affairs, to reviews of proposals by research funding bodies, and to reports prepared for the European Union. Thus the market increasingly encroaches on both domains of policy that used to be limited to political elites or corporate boards and domains of knowledge production that used to be the sanctuary of scientists. This is related to an erosion of the authority of science as such and of natural science in particular, and to the democratization of the relation between scientists and the lay public. Traditionally, policy makers – and the broader public – have seen science as a representation of objective reality, free from value components and expressed in a particular kind of formalised, structured language. Decision makers wishing to grasp social processes would likely turn to the kinds of work in social science that corresponded to these norms – modeled on the natural sciences – and showed society as operating within a framework of structured mechanisms that one could understand and even predict, if only one put sufficient good research into it. But the growing anti-elitism of liberal democracies, the general distrust of state authority that intensified in the 1960s, the perceived complicity of the natural sciences in the arms race, and the growing influence of environmentalist movements all contributed to challenging the privileging of science over other forms of knowledge. Demand for a democratic oversight over the class of experts was seconded by a growing number of social researchers who called into question the value free nature of scientific advice by claiming that scientific knowledge is itself powerfully shaped by cultural forces. The declining influence of the sciences as ultimate arbiter of human dilemmas was inseparable from the rise of such cultural critique, resulting by the 1990s in a shift away from privileging “hard,” quantitative, economic explanations and towards foregrounding “soft,” cultural ones. This “cultural turn” was visible in public debate, but had an even more powerful effect within academic disciplines such as history, sociology, and geography, as well as economics, medicine, and even business studies. (In 2006/7 the University of Leipzig in Germany, for example, offers a course on “The Cultural Turn and Its Consequences for Physical Education” to its physical education students.) In a review of the “cultural turn” in the humanities, Peter N. Stearns points to how the inclusion of culture in research assumptions has enriched our understanding of the sense of smell, the history of emotions, the nature of illness, and gender roles in society among others (Stearns, 2003). As before, cultural explanations have to contend with biological ones; in fact, they have to do so in more areas than before, as advances in genetics, claiming to have discovered genes responsible for obesity or human cooperation (Ridley, 1997) continue to reshape the boundary between biological determination and cultural learning. Nonetheless, it is safe to say that, in the general public, cultural explanations are now much more readily invoked to challenge the authority of “hard” science than twenty years ago, while, surprising as it is, “culture experts” are less likely to be challenged, say, on the customs of Iraq than physicists on the safety of nuclear reactors. “The punditocracy,” as anthropologist Bill Maurer writes, “are our modern day mythmakers” (comment on Besteman and Gusterson, 2005, dust jacket). The “cultural turn”, and indeed many of the processes we have outlined, would not have occurred without the emergence of the civil rights movement. From its inception in the 1950s and early 1960s United States, this movement developed from a struggle for “racial” equality based on ideals of universal rights and responsibilities into an ideology of asserting and celebrating cultural distinctiveness in the 1980s and 1990s, when the “politics of recognition” caused school curricula to be rewritten, and museums established to showcase “Black history” – but also, now, its Chicano, Asian-American, and Native American equivalents. The rigid bounding of ethnoracial categories, a unique heritage of 19th-20th century America institutionalized in the US Census, was now further solidified by turning it into a “heritage” to be cherished – resulting in greater identification with what previously were stigmatized ethnic labels. Thus, between 1970 and 1980, the population of American Indians in the United States grew from 800 thousand in 1970 to 2.5 million in 2000, a rate that can only be explained by more people identifying themselves as Indians. Marshall Sahlins points to the civil rights movement as being at the root of “the formation of … a culture of cultures,” as more and more groups, from American Indian “First Nations” to sexual subcultures, developed a new level of self-consciousness about their own way of life, discovering (and reinforcing and inventing) their own specificity vis-à-vis other groups in society (Sahlins, 1993). Although what Dwora Yanow calls the “lumpy hyphen” – the creation of large, bounded ethnic categories like “Latino-American” (Yanow, 2002) – is unique to the United States, the effects of the politics of ethnic representation have been felt very widely. Canada and Australia first, and then some European states, adopted ideologies of “multiculturalism,” which stressed the right to cultural difference alongside the right to equal citizenship. In the international arena, organizations fighting against racism, for minority rights, and for the recognition of indigenous peoples have adopted the language of cultural distinctiveness in advancing their causes. Support for such groups – whether Gypsies in Romania or Dayaks in Borneo – often comes from North America, Western Europe, or from activists of the “global South,” and in order to be heard, their grievances must be articulated in the stylized language of cultural rights. Thus, the Ainu, the indigenous people of officially ethnically homogenous Japan, have successfully managed to revitalize their cultural identity since the 1970s by establishing tourist villages, in which not only Ainu food and crafts are produced and sold, but children are taught the Ainu language and traditions. In 1997 a Japanese court for the first time officially accorded the Ainu minority status, potentially opening the way for land claims and representation in central or local government (Morris-Suzuki, 1999). How important a role culture plays for minority movements can also be seen from the story of a folklorist who was recently abducted by Khasi separatist rebels in the Indian state of Meghalaya and taken to a clandestine camp. “They asked him to stay there for two weeks to talk about folklore of the Khasis in order to inspire some sort of unity among the cadres (Kharmawphlang et al., 2004). The last great trend contributing to the culturalist phase is the desecularization of the world. Since the burning of Salman Rushdie’s Satanic Verses in 1989, religion has been steadily reclaiming the place in public and political spaces that it had lost during the rationalist era of the Cold War on both sides of the Iron Curtain. Evangelical Christianity and Islam in particular, but also other old and new religions, have been spreading rapidly and waging political claims in new arenas – from anti-abortion politics in Africa to Hindu mobilization in the diaspora and Falungong’s global war against the Chinese government. While the relationship of religion to cultural representation is a complicated one – many religious movements want to transcend cultural divisions, while others, like the Christian Right in the United States, argue against them for political reasons – in a number of cases religious authority has reasserted itself as cultural authority. Examples are found in Europe, where states dissatisfied with the politics of liberal multiculturalism are seeking religious figures able to speak for and exert power over “Muslim” constituencies, and in Iraq, where, based on a similar logic, religious divisions are taken for a synonym of ethnic groups and religious leaders are endowed with a self-fulfilling clout of influence. The fact that “culture” is increasingly frequently invoked does not mean that people mean the same thing by it. Until the 1980s, “culture” in everyday parlance referred mainly to the arts. Since the “cultural turn,” people have started talking about “gay culture”, “company culture” or “culture of poverty”. Western businessmen write bestsellers about “Confucian culture” in China while Chinese newspapers berate the “clique culture” of officials and write about “residential culture” in articles promoting upmarket apartments. In other words, while “culture” is still in use in its first sense as art (and science), it is now increasingly used to encompass all human behaviour that is not biologically determined. Although in principle such usage could refer to all of humankind, in practice it mostly constructs “culture as difference”, as a set of attributes that distinguishes one group of people from another. As Seyla Benhabib writes, “much contemporary cultural politics … is an odd mixture of the anthropological view of the democratic equality of all cultural forms of expression and the Romantic, Herderian emphasis on each form’s irreducible uniqueness” (Benhabib, 2002:3). Joana Breidenbach and Pál Nyíri, Seeing Culture Everywhere: From Genocide to Consumer Habits, Seattle and London, University of Washington Press, 2009. Anderson, Benedict. 1983. Imagined Communities: Reflections on the Origins and Spread of Nationalism. London: Verso. Antweiler, Christoph. 2003. “Anthropologie gewaltsamer Konflikte: Konfliktmotoren und Gewaltmotive” (The anthropology of violent conflicts: Motors of conflict and motives of violence). Entwicklungsethnologie 12, nos. 1 and 2: 26–73. Benhabib, Seyla. 2002. The Claims of Culture: Equality and Diversity in the Global Era. Princeton, N.J.: Princeton University Press. Besteman, Catherine, and Hugh Gusterson. 2005. Why America’s Top Pundits Are Wrong: Anthropologists Talk Back. Berkeley: University of California Press. Besteman, Catherine, and Hugh Gusterson. 2008. Response to Matti Bunzl: Public Anthropology, Pragmatism, and Pundits.” American Anthropologist 110, no. 1: 61–63. Bissell, Tom. 2007. “Those Wild and Crazy Estonians.” The New Republic, 15 January. Bourdieu, Pierre. 1986. “The Forms of Capital.” In John G. Richardson, ed. Handbook for Theory and Research for the Sociology of Education, 241–258. Westwood, Conn.: Greenwood Press. Fisher, Glen. 1998. The Mindsets Factor in Ethnic Conflict: A Cross-Cultural Agenda. Yarmouth, Maine: Intercultural Press. Friedman, Sara L. 2004. “Embodying Civility: Civilizing Processes and Symbolic Citizenship in Southeastern China.” Journal of Asian Studies 63, no. 3: 687–718. Hannerz, Ulf. 2004. Foreign News: Exploring the World of Foreign Correspondents. Chicago: University of Chicago Press. Hugo, Graeme. 2005. “Chinese Academic Migration to Australia.” Paper presented at the conference “People on the Move: The Transnational Flow of Chinese Human Capital,” Hong Kong University of Science and Technology, 20–22 October. Johnson, Kirk. 2000. TV and Social Change in Rural India. New Delhi: Sage. Kemper, Steven. 2001. Buying and Believing: Sri Lankan Advertising and Consumers in a Transnational World. Chicago: University of Chicago Press. Kharmawphlang, Desmond, et al. 2004. “Conversation 2: Folklore and Identity.” Indian Folklife 3, no. 2: 18–20. Lee, Terence. 2004. “Creative Shifts and Directions.” International Journal of Cultural Policy 10, no. 3: 281–299. Morris-Suzuki, Tessa. 1999. “The Ainu: Beyond the Politics of Cultural Coexistence.” Cultural Survival Quarterly 23, no. 4. Pobłocki, Kacper. 2002. “Becoming-state: The Bio-cultural Imperialism of Sid Meier’s Civilization.” Focaal—European Journal of Anthropology, no. 39: 163–177. Reich, Robert. 1992. The Wealth of Nations: Preparing Ourselves for Twenty-first Century Capitalism. New York: Vintage. Ridley, Matt. 1997. The Origins of Virtue: Human Instincts and the Evolution of Cooperation. London: Viking Penguin. Sahlins, Marshall. 1993. “Goodbye to Tristes Tropes: Ethnography in the Context of Modern World History.” Journal of Modern History, no. 65: 1–25. Schein, Louisa. 2005. “Approaches to Transnationalism and Diaspora Research: Researching the Hmong Diaspora’s Longing for a Chinese Homeland.” In Joana Breidenbach and Pál Nyíri, eds. China Inside Out: Contemporary Chinese Nationalism and Transnationalism, 99–140. Budapest, Hungary: Central European University Press. Schönhuth, Michael. 2005.“Die kulturelle Dimension der Entwicklung: Eine Standortsbestimmung und ein Überblick zum State of the Art” (The cultural dimension of development: Defining where we are and an overview of the state of the art). Report for the Stabsstelle Unternehmensentwicklung, OE Politik, und Strategie. Trier, Germany. Stearns, Peter N. 2003. “Expanding the Agenda of Cultural Research.” Chronicle of Higher Education, May. Yanow, Dwora. 2002. Constructing “Race” and “Ethnicity” in America. Armonk, N.Y.: M. E. Sharpe. 1 The International Journal of Cultural Policy, in which this article appeared, has been published since 2002, another sign of increased interest in cultural policy as an element of governing. Professor of global history from an anthropological perspective at Amsterdam’s Free University, Pál Nyíri has a PhD in history from Moscow. He pursued undergraduate studies of chemistry in Moscow, Budapest, and New Jersey, followed by graduate training in Asian studies in Oregon. He also had research fellowships in Oxford, Budapest, and Berlin, and has taught at Macquarie University in Sydney. His research area includes human mobility (particularly migration and tourism) and the cultural politics surrounding its management and containment, as well as China. His publications include Seeing Culture Everywhere. From Genocide to Consumer Habits, Seattle and London, University of Washington Press, 2009 (with Joana Breidenbach); Scenic Spots. The Construction of the Chinese Tourist Site and the Question of Cultural Authority, Seattle, University of Washington Press, 2007; Transnational Chinese. Fujianese Migrants in Europe, Stanford, Stanford University Press, 2004 (with Frank N. Pieke, Mette Thunø, and Antonella Ceccagno); China Inside Out. Contemporary Chinese Nationalism and Transnationalism, Budapest, Central European University Press, 2005 (ed. with Joana Breidenbach); and Globalising Chinese Migration, Aldershot, Ashgate, 2002 (ed. with Igor R. Saveliev).